Clean and trim Brussels sprouts – removing any browned outer leaves and cutting off the stem. Cut any large Brussels sprouts in half. Place the Brussels sprouts on a sheet pan and drizzle with 1 tablespoon of olive oil and with your hands, toss to coat. 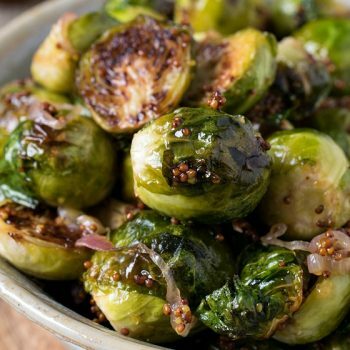 Spread the Brussels sprouts in a single layer on the pan, then roast for 20 to 25 minutes or until tender and caramelized, but not over cooked. While the Brussels sprouts are roasting, in a small sauce pan heat the remaining tablespoon of oil over medium heat. Add the shallots and sauté until they start to turn golden – about 2 to 3 minutes. Add the whole grain mustard, sherry, vinegar, honey and water and stir to combine and heat through, stirring until the water has evaporated. Remove from heat and set aside. When Brussels sprouts are done roasting, remove from the oven and place in a large bowl. Pour the shallot and mustard mixture over the hot Brussels sprouts and toss to combine.